« CG7 Admits Change, But Sardis A Joke? 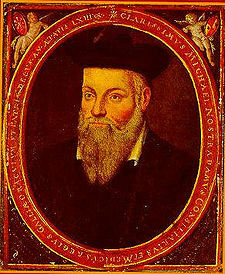 Last month I reported that an article by the Daily Squib that stated that someone at the Smithsonian Institute who claimed to have found new Quatrains from the famed French Catholic seer known as Nostradamus seemed to be a satirical hoax (see Nostradamus’ Predictions of Obama: A Hoax?). Twice last month, I wrote the Daily Squib to ask if they would stand behind their story (which is popular on the internet). Last week I sent you an email (copied below my name) asking if you would stand behind an article by Andrew Olsen, titled Nostradamus Obama Prophecies Revealed (The Daily Squib. April 10, 2008). Could you please tell me if you will stand behind the facts in that article? Or if there even is a writer for you that is really named Andrew Olsen? If not, I intend to report to my readers that you will not stand behind it, and thus that the article basically must be a hoax. While I recognize that there is a certain amount of satire in your website (e.g. “096,459,537,267,843″ visits “IN PAST HOUR” according to your home page), I would like to ask a question. There are sources on the internet that suggest that an article by Andrew Olsen, titled Nostradamus Obama Prophecies Revealed (The Daily Squib. April 10, 2008) is not possibly valid as there apparently was no one at the Smithsonian named Professor Eugene Randell (who was claimed to be the Deputy Director of the Smithsonian Institution Archives in the article). No other source seems to have reported this announcement allegedly made by the Smithsonian–somewhat odd considering the fame of Nostradamus. Also, since there seem to few (if any) other articles by Andrew Olsen, is it proper to conclude that the article was simply intended as satire? Do you have someone named Andrew Olsen who writes for you? Do you stand by the statements in the article that a Professor Eugene Randell, Deputy Director of the Smithsonian Institution Archives, made the claims about a new release of prophecies from Nostradamus? Or shall I presume that the article was not intended to be taken seriously? Sadly, the Daily Squib did not respond to either email. Since its article is quite popular, I felt that I should address it here. While there are biblical and other reasons to believe that US President Barack Obama will be instrumental in the fulfilling of certain prophecies (even some of the legitimate older writings of Nostradamus might, see Prophecies of Barack Obama? ), articles that seem to make things up tend to make people discount real reasons that Barack Obama is in a sense prophetic. The timing of his election is close to the end of the 6,000 years that God gave humanity to rule itself is about over (see Does God Have a 6,000 Year Plan? What Year Does the 6,000 Years End? ), the USA is attempting accumulate more debt which seems to fulfill the prophecies of Habakkuk 2 (see Anglo – America in Prophecy), soon the King of the North will rise up, soon the King of the South will rise up, relatively soon the Great Tribulation will begin (Can the Great Tribulation Begin in 2009, 2010, or 2011?). As the President of the United States this late in the 6,000 years (see Does God Have a 6,000 Year Plan? What Year Does the 6,000 Years End? ), Barack Obama will directly or indirectly have a part in many of those events. But by putting out a story that it will not stand by, a story that seems to not have any basis in fact, the Daily Squib seems to be interfering with those looking for reliable prophetic news that may involve the new USA president. Kenya Rejoices as Obama Wins This is a follow-up to the Barack Obama, Prophecy, and the Destruction of the United States news item and contains additional information about him, prophecies, and his background. And when the United States and its Anglo-allies may be destroyed. Barack Obama is Not the Antichrist Some have suggested that he may be, but he cannot be. Find out why. This entry was posted on Friday, February 6th, 2009 at 7:06 am	and is filed under Prophecy. Nostradamus’ Predictions of Obama: A Hoax?